SPRINGFIELD, Mass. 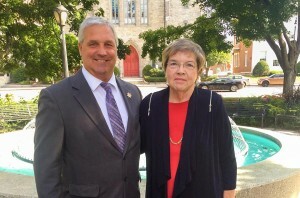 – Berkshire County Sheriff, Thomas Bowler, today announced his endorsement of Mary Hurley, Candidate for Governor’s Council in the eighth district. Born and raised in Pittsfield, Sheriff Thomas Bowler is the 21st Sheriff of Berkshire County. Prior to his election in November 2010, Bowler was a 24-year veteran of the Pittsfield Police Department, serving as a detective since 1988. He was the key leader in solving some of the city’s largest high-profile crimes and is well-respected throughout the region. For more information about Mary Hurley and her bid for Governor’s Council, please visit electmaryhurley.com.